The first of Bjork’s seven sold-out NYC shows happened on Saturday (3/7) at Carnegie Hall, one day before her MoMA retrospective opened to the public. The noon matinee also featured her Vulnicura collaborator Arca, percussionist Manu Delago and 15-piece chamber ensemble Alarm Will Sound. Her set was divided into two sections, with intermission, and then a two song encore. Setlist and video from the show are below. 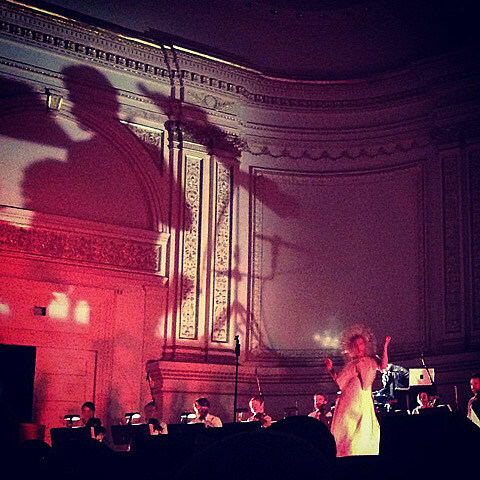 She’ll perform another Carnegie Hall matinee this Saturday (3/14), followed by two Kings Theatre shows (both on 3/22) and three City Center shows (3/25, 3/28 and 4/1). Again, all of those are sold out, but she also plays Governors Ball, which is not sold out. Framestore created a number of visual effects, including the stars and the glowing embers that surround Björk, as well as enhancing the video’s other-worldliness by extending her legs to unnatural proportions. The exquisite coloring for the piece was done by Tim Masick of Company 3, turning her into the exotic, red-toothed, bronze dancer.